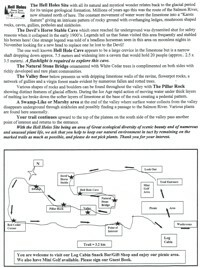 Hell Holes Nature Trails and CavesRecord Owner? Log in. From Highway 401 Exit No. 579, 10.7 km North, turn right at Centreville Rd., continue 5.5 kms. following signs. 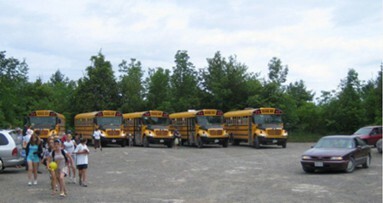 Open weekends Victoria Day - Father's Day, 10 am to 5 pm; Daily Father's Day to Labour Day, 10 am to 5 pm. Weekends only after Labour Day, 10 am to 4 pm. Weekdays by appointment. 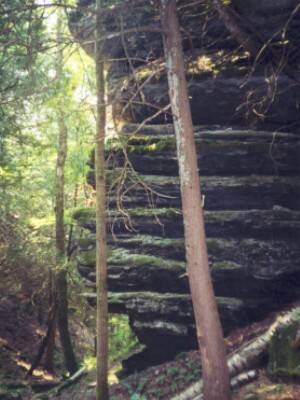 Cross a natural stone bridge. Adventure downward below the bridge and notice the atmosphere of a mini-like rain forest. This area is plentiful in small mammals. 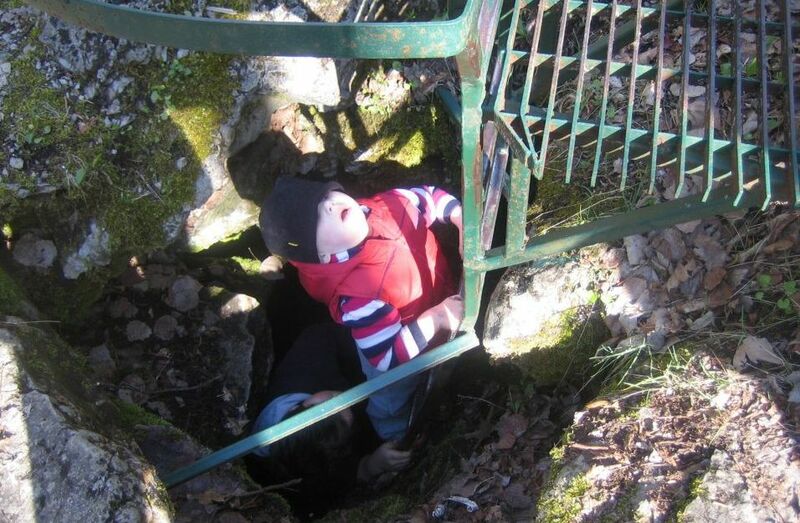 Walk through a rugged criss-crossing gorge with over-hanging ledges, grottos, flowerpots, mushroom shaped rocks and sinkholes. 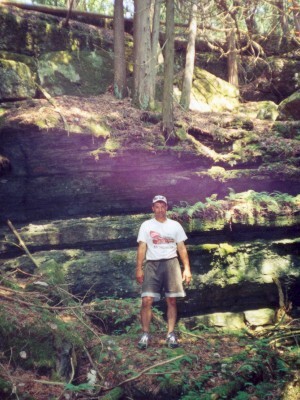 Enjoy a 3.2 km self-guided tour through a unique geological area of Eastern Ontario. 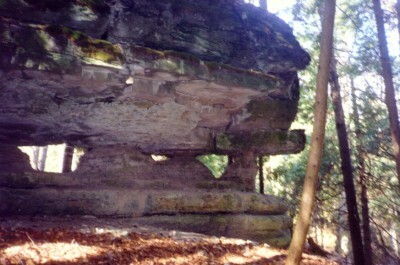 Step back in time to explore the rock formations that were created during the glacial period and see rare plants that have developed over the area. 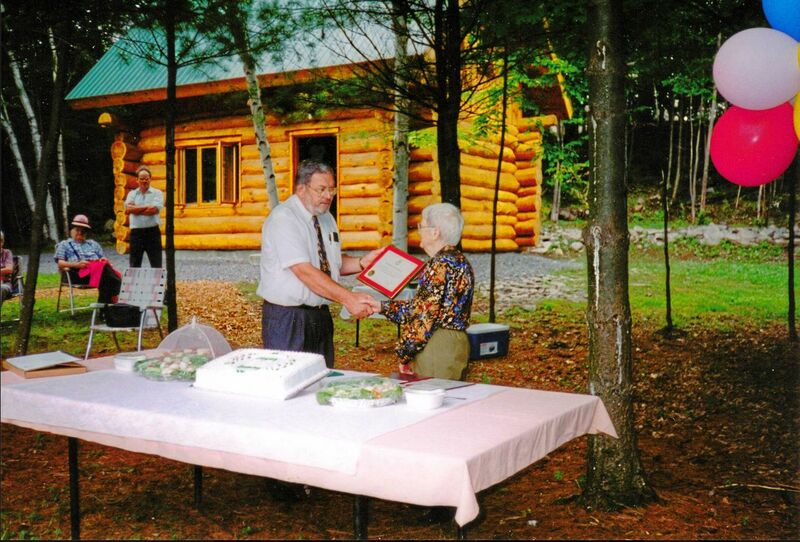 Visit our Log Cabin Snack Bar and Gift Shop. 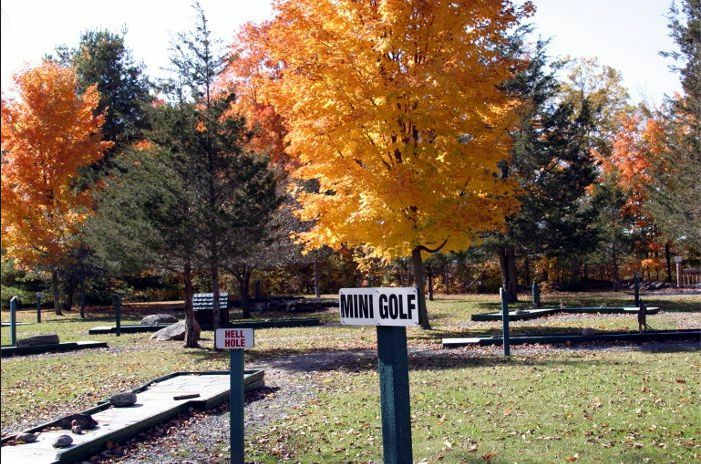 Picnic and playground are available. Admission: Adults $7.00, Youths (5-15) $5.00, Children under 5: FREE. 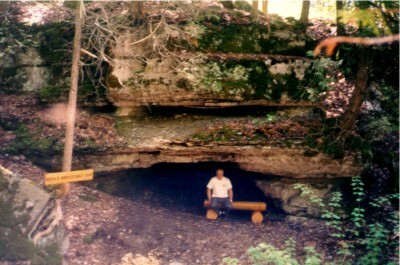 Have something to say about Hell Holes Nature Trails and Caves? Nice affordable walking trail. 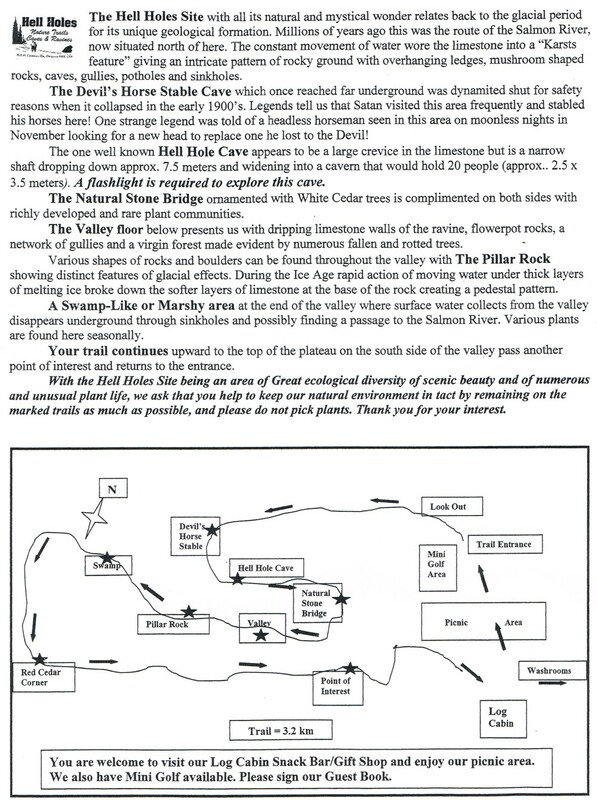 Has the Hell Hole cave you climb down (headlamps needed) You can rent headlamps there but we opted to bring our own. Very scenic walk. Made for a nice day out. Bring the bug spray! But wow.... what an awesome walk through nature. Saw a deer, lots of squirrels, raccoon 'signs', etc. The whole family had a blast. Cannot wait to do it again. So clean, so fresh, so fun. If you have not been - do it! 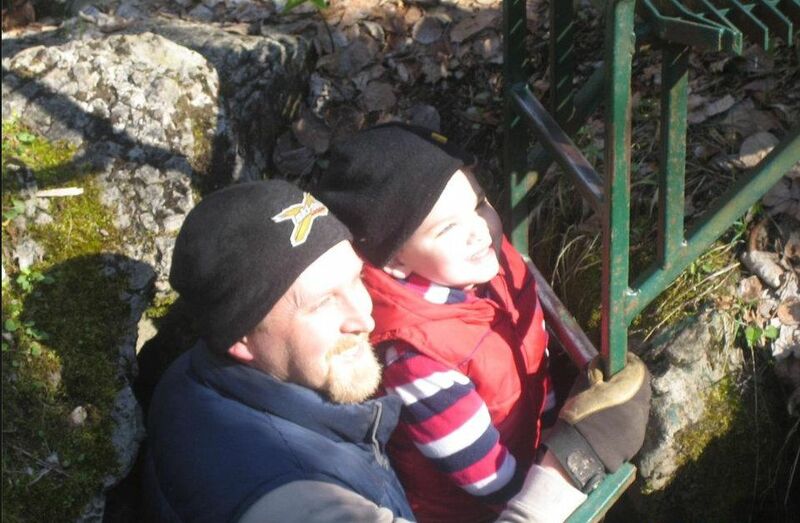 I took my 6 year old son and myself. It was such a great time. I have wanted to go for years but never did and we did this past weekend and plan on returning again shortly. Bug Spray a must and they do provide, but bring your own also. Telling everyone what a great time this was. Thank you!! The hike itself is about an hour or so. 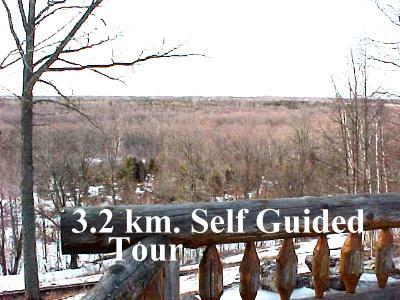 It's 3.2km, so it depends how fast you hike and how much you like lingering over stuff. 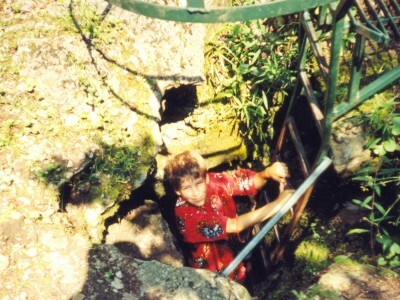 The hell hole itself is a 20 foot sinkhole with a tiny opening, accessible by ladder. Once inside, it's pretty small in there, and in my opinion, a little creepy. It's pretty much pitch black. You can rent flashlights for $1.50 or you can use your husband's crappy cell phone which doesn't actually emit much light, then end up using your fancy camera's flash assist which only lights up for 2 seconds, giving you the double anxiety of worrying about dropping it on the craggy rocks or flashing it once and seeing some sort of cave monster appear in that second. I think if we had prepared ourselves with a thick slathering of bug spray and brought... I don't know... WATER, we would have enjoyed the hike much more. Also, the screaming teenagers that were just ahead of us on the trail ruined the peacefulness a bit. 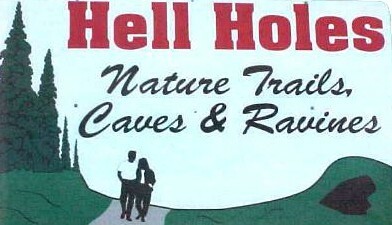 My husband and I saw Hell Holes on a map and knew we had to check it out. 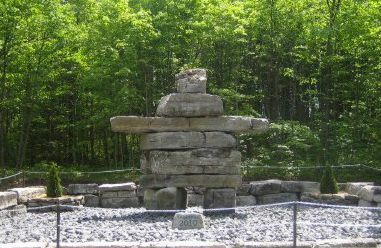 We had a fantastic afternoon exploring the trail, mini-putt, and the new Inukshuk! The owner is lovely and was always ready to help and chat. Don't forget your BUG SPRAY and FLASHLIGHT! You'll absolutely need them! Highly recommend this little rural gem. My wife, kids and I have taken the trek quite a few times. 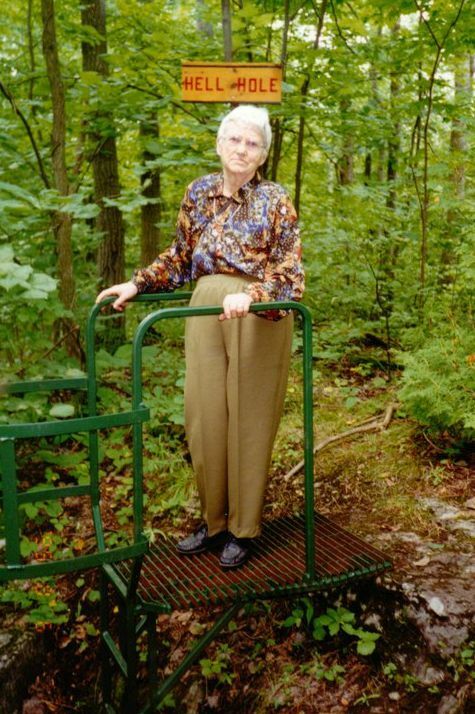 We enjoy many walking trails near Kingston. Our first experience here was cut short by the mosquitoes. When we go now, we go in the cooler weather, when the little biters are gone. 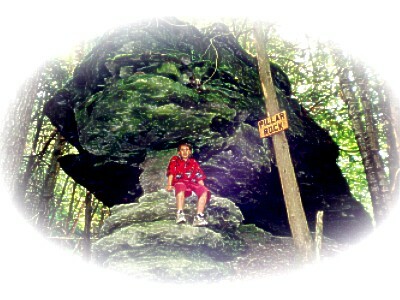 The scenery is wonderful, one moment you are walking through the woods, the next you are climbing small rock hills. You can peek down over cliffs into a ravine and the next moment you are down there amongst the hundreds of tall cedar trees. I'm looking forward to the next trip! Fantastic! Great autumn day and beautiful hike with our family. The caves are awesome and great chance to cool off! I can't believe that this is a privately maintained site, you folks deserve a big ongrats on a job well done!! Thanks very much for a fantastic day. Voici un endroit magnifique a visiter! La beaute du paysage est surprenante. Je ne croyais pas qu il etait possible qu un seul endroit contienne tant d accidents geographiques. Nous transporte dans un monde quasi feerique. Mon coin prefere fut ce qui est identifie comme 'la vallee'. Quel endroit de reve pour faire de magnifiques photos! Vraiment par moment, j avais l impression de visiter les scenes d'Harry Potter ou Lord Of The Ring. C est a en coupe de souffle!Attention aux moustiques! What an amazing place. If you love nature this is a must see. There is a picnic area so bring your lunch. Don't forget your Flashlight, Camera, good walking shoes and bug spray. If you have been there before, there is a new 'point of interest' this year. 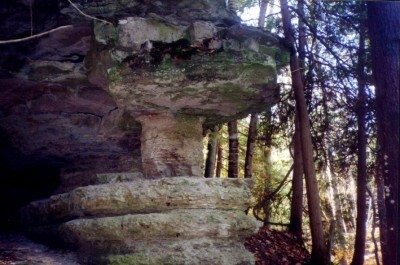 (An Inukshuk, approx. 15 feet high.) Any Photo Clubs would have a field day. A truly fascinating and mystical experience. The limestone landscape eroded by glacial runoff has carved out a fairytale wonderland.There are caves and sink holes and a deep ravine with 1oo foot limestone cliffs dottet with scalloped caves and rock formations supported by only slim columns.The quiet walk through the ravine was awe-inspiring,humbling,and reminded me of being in a magnificent cathedral only this one was natural with towering trees reaching for the sun. 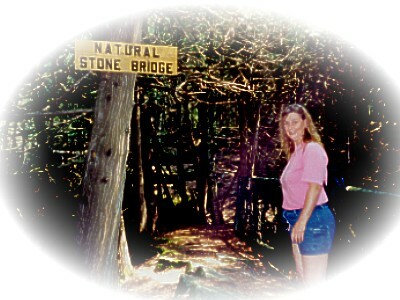 I found it to be a trully spiritual experience and will return to see it again with its fall colours.